Although this has been described as a reliquary, it is more likely that it functioned as a container for the consecrated bread for the Mass. The base is a chest with a hinged lid - there are traces of silk inside. The sprouting cross is a well-known type indicating the belief that Christ's cross was made from the Tree of Life in the Garden of Eden. This symbolised Christ's sacrifice as the redemption for original sin. Here Christ is being removed from the cross - a subject known as the Deposition. One man uses pliers to remove the nail from his left hand, while another supports the corpse around the waist. The figures to either side represent Nicodemus and Joseph of Arimathea. Both are described in the New Testament as caring for Christ's body after his death (Matthew 27:57-60, Mark 15:43-46, Luke 23:50-53, John 19:38-42). The chest below therefore represents Christ's tomb into which his body was placed after his death. A related object in Nuremberg has figures of sleeping soldiers engraved on the sides of the chest, as shown in representations of Christ's tomb, thus making the connection clear. 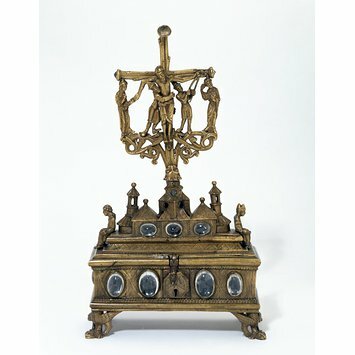 The object consists of an upper crucifix with Deposition group, set on top of a lower chest-shaped base. It is made of bronze, which was originally gilded. Traces of this gilding survive particularly on the end panels, but it is much worn consistent with use over many years. The bronze cross is of the 'Lebensbaum' type, sprouting like a living tree. The three ends of the cross bars are ornamented by rock crystal 'buds'. The figure of Christ is supported by the bearded figure of Joseph of Arimathea, who wears a hat and has his arms around Christ's waist. To the right the bearded figure of Nicodemus uses pliers to remove the nail from Christ's left hand. To the far right is the standing figure of St John, bareheaded with short hair, to the far left the figure of the mourning Virgin, with a hat, longer hair and holding Christ's right hand. 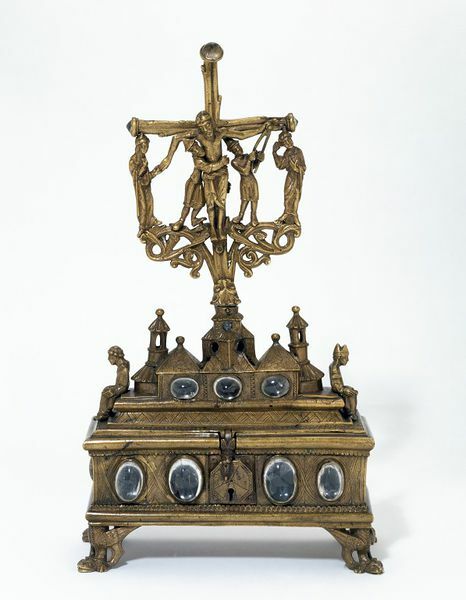 All four figures stand on bronze scrollwork which protrudes horizontally from the lower part of the cross, and the heads of the outer figures slot into the ends of the cross arms. The base consists of a rectangular chest with hinged lid. The foot of the cross slots into the top of one of several fictive buildings with pitched and domed roofs, which decorate this lid. The front of the buildings is decorated with three oval cabochon rock crystals. The back of their roofs are perforated with eight circular holes, which may have once held smaller rock crystals or precious stones. There are also two similar holes on the sides of the central building facing towards the front. To the right is a seated figure of a bishop, to the left a seated figure of a deacon, facing outwards. The lid itself echoes a sarcophagus in shape, and has a long catch in the form of a monster which protrudes down in the centre front. The rectangular base has a large oval cabochon rock crystal on either end, and four across its front, two each side of a central lock with octagonal plate. The bronze around them is engraved with simple designs.The reverse is engraved in far more detail with a vine scroll inhabited by human figures and monsters. The four feet, at each corner, are in the form of monsters with paws and wings, who bear the chest on their shoulders, with their heads and front feet leaning forwards to the floor, and their feathered wings extending back under the chest. Inside the chest are traces of silk. It has been said that the cross comes from St Servatius church, Maastricht (Mende 2006, p.470). The cross is of the 'Lebenkreuz' type, sprouting like a living tree. This makes an explicit link between the cross and the Tree of Life of the Garden of Eden, making the point that Christ's sacrifice was as a redemption for original sin. Die Zeit der Staufer 1977 suggests that the engraved foliage decoration on the reverse of the chest echoes this iconography. Although the object has been described as a reliquary, it is far more likely that it was a container for the consecrated host. The subject of the deposition is acted out above a chest, described by both Die Zeit der Staufer 1977 and Mende 2006 as Heiliges Grab (literally Holy Grave). This German term refers to a container for the eucharist, but also makes explicit the connection between the container and the Holy Sepulchre, in which Christ's body was kept before the Resurrection. A comparable object at Nuremberg (Springer 1981, cat. no. 7, plates K55-6) actually has sleeping soldiers engraved on the front, making a definite connection with Christ's tomb. The shape of the lid like a sarchophagus also confirms this. The clerics depicted seated on the top are likely to represent the liturgy of the Mass. The back of the chest is decorated with very fine scrolls inhabited with monsters and human figures - this has close links with manuscripts of the period. The engraved decoration on the front is far cruder and more simple. There are several holes which have been punched into the base, mostly on the reverse. These have clearly been added after it was made, as they are roughly made and pierce through existing engraved decoration. They may indicate that the base was used in later years as a form of censer. Die Zeit der Staufer 1977 describes the cross as Rhenish-Mosan, possibly from Trier, but Ursula Mende's catalogue entry in Canossa 1077, 2006, convincingly argues for a Mosan origin in about 1150. She indicates that the style of the two outer figures of the Deposition Group are different in style to the central figures, scrollwork and seated figures.